Two of the most collectible reds in the Okanagan are the flagship wines from Foxtrot Vineyards and Painted Rock Estate Winery. Both have released superb wines from the 2010 vintage. I have notes on both, along with a note on Painted Rock’s 2010 Merlot, also just being released. Both wineries pull out all the stops to make their wines. Gustav Allander, the winemaker at Foxtrot, believes the 2010 Pinot Noir is the best he has made. I believe he has been involved in the last five vintages; the first three were made under Foxtrot’s direction at Lake Breeze Vineyards. The vines at Foxtrot were cropped sparingly and the bunches were given a long hang time, with the harvest taking place on October 27. Fermentation involved one-third whole clusters in the fermenters and two thirds whole berries plucked from the stems very gently. In that vintage, Foxtrot was using a new destemmer so gentle that the berries looked as if they had been removed from the clusters by hand. With Pinot Noir, gentle handling is paramount for the development of smooth tannins. The berries underwent a six-day cold soak before fermentation began. Fermentation lasted almost three weeks. Then the wine went into new barrels to age on the lees for 18 months. It is remarkable how subtle the oak is on the palate. Painted Rock’s processing notes are not as extensive but one can assured that the vines also were cropped very moderately and the grapes were handled equally carefully. Once again, the wine was matured 18 months in French oak, 80% of which was new. The other news at Painted Rock is that the opening of a new tasting room is imminent. For the last several years, the tasting room was crammed into a temporary building. It is being replaced by an elegant and smart wine shop with windows overlooking the vineyard and Skaha Lake. It is a million dollar view. Here are notes on the wines. Foxtrot Vineyards Pinot Noir 2010 ($55). This wine begins with spicy cherry aromas. The flavours have a core of cherry and raspberry framed by the spice of expensive French (François Frères) oak barrels. The wine has begun to develop the rich, silky texture that is the hallmark of Foxtrot. 92-94. Painted Rock Red Icon 2010 ($55). The flagship of the Painted Rock portfolio, this is a blend of 21% Merlot, 39% Cabernet Franc, 11% Cabernet Sauvignon, 18% Petit Verdot and 11% Malbec. The wine delivers a spectacular aroma of red berries, black currants and vanilla. The texture is firm on opening, as it should be for a wine meant to cellared. As the wine opens, it presents flavours of black cherry, black currant, cola, chocolate and spice. 92-94. Painted Rock Merlot 2010 ($40). This is a rich, intense Merlot with 14.3% alcohol, denoting surprising ripeness from a cool vintage. There was good viticulture happening here. The wine begins with aromas of blueberry and blackberry. On the palate, there are flavours of black currant, blueberry, cola and coffee. The tannins still are firm and the wine deserved to be cellared four or five years to reveal its ultimate quality. 91. The newest producer in the Similkameen Valley, Corcelettes Estate Winery, received its license this week, enabling it to begin selling its two excellent and well-priced wines. Clearly. there is a Swiss influence in this winery. Currently, only two other wineries have Chasselas: Quails’ Gate, where it was planted years ago when a nursery sent vines different from what had been ordered; and St. Hubertus, where the owners are from Switzerland. The Baessler family came to launch a winery in the Similkameen Valley by a circuitous route. “It all started because my mom and dad on our place in Switzerland had the best blood line in Simmental cattle,” Urs says. A friendly big-boned man with a booming voice, Urs explains that his given name means bear; it fits him. Born in 1954, he was 17 when four Manitoba farmers bought six Simmental heifers from Domaine de Corcelettes, the Baessler family farm on Lake Neuchatel. Urs accompanied the heifers to Canada. He stayed the summer and decided he wanted to farm here. He spent several years travelling back and forth, learning how to farm in Canada while finishing compulsory military service in Switzerland. Staked by his grandfather with a down payment, Urs and Barbara bought a grain farm near Brandon and grew their first crop in 1978. When wheat prices collapsed in the early 1990s, they diversified with a buffalo farm in Cody, Wyoming, starting with 20 animals. “You know, coming from Switzerland, I was born and raised in the mountains and I have always missed the mountains,” Urs says. “That was why we ended up going to Wyoming, why we bought that ranch, because we wanted to be near mountains. I could get to Cody in one day from Brandon and be in the Rockies. The Baesslers wound up the ranch and then decided to sell the Manitoba farm. “We did not like the winters either,” Urs says. This time, the quest for mountains and better weather led to the Similkameen Valley in 2007 where they bought an organic garlic farm near Cawston. In 2010, they began planting vines. “The goal always was to have some grapes,” Urs says. The family now has 2 ½ acres at the winery and, with a partner, 5.7 acres of vines nearby on Middle Bench Road. Son Charlie, who was born in 1985, is a key part of the decision to open a winery. He has a degree in environmental sciences from the University of Lethbridge but did not go into that field after visiting the Similkameen and taking a vineyard job with Herder Vineyards. “Farming chose me,” he says. In 2008, he joined Burrowing Owl Vineyards, where he is now an operations manager. There, he began to learn winemaking under the tutelage of Bertus Albertyn, the winemaker at Burrowing Owl from 2010 until this summer. Corcelettes’s first wines were made under Bertus’s supervision at Maverick Estate Winery, the new winery that Bertus launched last year. Corcelettes is modifying a farm building on its property to accommodate the 2013 crush. The family is still debating whether to have a small tasting room there or in Barbara’s artist studio nearby. In any event, there is not enough wine yet to support regular tastings. The winery, with a modest target of 1,500 cases by the fourth year, debuted with 112 cases of TriVium 2012 , a white blend anchored by Chasselas, and 85 cases of Menhir 2011, a blend of Syrah and Cabernet Sauvignon. Menhir is the name for Stonehenge-era stone obelisks erected throughout Europe for ceremonial purposes. A menhir stands on the Baessler family farm in Switzerland and Urs intends to erect a similar boulder at the winery. TriVium 2012 ($18 for 112 cases). This is 45% Chasselas, 30% Gewürztraminer and 25% Pinot Gris. It is a delicious blend, with layers of apple, peach and citrus flavours and with a crisp and lightly spicy finish. 90. Menhir 2011 ($25 for 85 cases). This is a blend of 55% Syrah and 45% Cabernet Sauvignon. It starts with intense and appealing aromas of black cherry, vanilla and white pepper, all of which are echoed on the palate. The generous texture is rich and ripe. 91. Three of the Okanagan’s best winemaker jobs – at Burrowing Owl, Quails’ Gate and Osoyoos Larose – have now been filled. Quails’ Gate Estate winery has just announced that former Mission Hill winemaker Nikki Callaway moves to Quails’ Gate August 1, taking over from Grant Stanley. 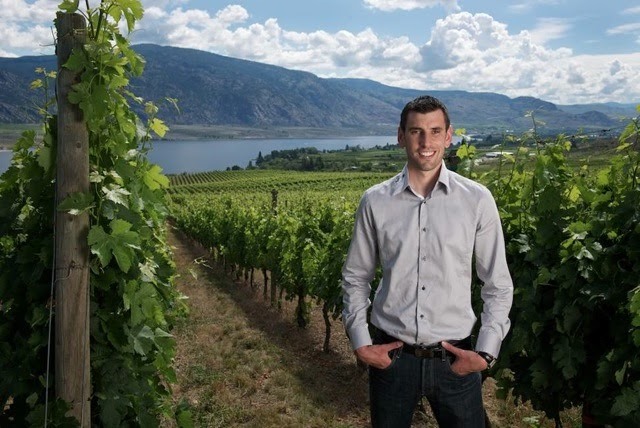 Osoyoos Larose announced last week that Bordeaux winemaker Mathieu Mercier is filling the post left vacant when Pascal Madevon left in January to join Don Triggs’s Culmina Family Estate Winery. Burrowing Owl Estate Winery has yet to make a formal announcement. However, Tom DiBello, the former CedarCreek winemaker, is taking over from Bertus Albertyn, who left Burrowing Owl July 12 to focus on his own project, Maverick Estate Winery. Here is the text of the Quails’ Gate news release. July 23, 2013 (Vancouver, BC) – Quails’ Gate winery is pleased to announce that Nikki Callaway has joined the team as winemaker. Nikki is already well known in the BC wine industry, and she brings with her a wealth of experience gained working in vineyards around the world. She worked the harvest in South Africa's Stellenbosch region, as well as holding several cellar master positions throughout France, including in the Loire, Burgundy and Bordeaux regions. Nikki’s official start date at Quails’ Gate will be August 1st, 2013. A Canadian by birth, Nikki spent nearly a decade living in Dubai, UAE before returning to Canada for her formal education. She successfully completed her Bachelor’s in Biology at the University of Victoria in 2004, then headed to Europe to learn winemaking from the ground up. Her winemaking career began with the 2004 vintage in the Beaujolais (Château La Louvière) and Bordeaux (Château Palmer) regions of France and culminated when she graduated with a Diplôme National d’Oœnologue (DNO) from the Université Bordeaux II in 2007. Upon her return to Canada in 2009 she worked as a winemaker for Mission Hill Family Estate. Here is the text of the July 17 Osoyoos Larose announcement. Osoyoos, BC - There's always been a unique union between Old and New World winemaking at the South Okanagan's Osoyoos Larose; with the arrival of new winemaker Mathieu Mercier, that bond grows even stronger. Mercier has winemaking in his blood. Born in Cognac, France, he grew up in the vineyard at his family's estate. "When I was a kid I spent all my free time with my father in the vineyard, or in the winery," says Mercier. "I learned at a young age the significance of every detail when striving for the best quality." It was natural that he would study winemaking as a career. He holds both a Masters in Viticulture and Enology and a National Diploma of Enology from the respected Agronomic School of Bordeaux. In 2012, Mathieu spent time expanding his skills in viticulture and winemaking at Concha Y Toro's Don Melchor in Chile; at Swanson Vineyards and at Cain Vineyard and Winery in the Napa Valley; and in Bordeaux, working at several estates owned by Groupe Taillan. It was at the latter that he began to take an interest in Osoyoos Larose, and in winemaking in the Okanagan Valley. "My enthusiasm for the quality of the 'Grand Vin' and the pursuit of new challenges made me want to play a role in the continued success of the wine." In March of 2013, he moved to Canada for the opportunity to manage all the steps from vineyard to the cellar at Osoyoos Larose. "The incredible potential of the Okanagan Valley became obvious to me when I arrived here. The climate here is very good, with a lot of sun exposure and spectacular day to night temperature variations." Today, he is working closely with the team at Osoyoos Larose to implement exacting viticulture and vinification techniques that will help the finished wine express the unique terroir of the South Okanagan. "My goal is to always produce better quality grapes to make better quality wine year after year, without any compromises." Burrowing Owl’s decision is a full-circle appointment, returning a California winemaker to the cellar run during Burrowing Owl’s first seven years by Bill Dyer, a legendary California consulting winemaker. American-born Tom DiBello – now a Canadian citizen – previously made wine in California, Washington State and Australia. “I love making wine here more than any place I have ever been,” he told me several years ago. Tom right) took over at CedarCreek in 2000, succeeding Kevin Willemborg, another American winemaker. Born in 1957 in New York, Tom grew up in California’s Newport Beach, acquiring a lifelong love of surfing. After vacillating between medicine and business, he qualified as a winemaker at the University of California. His first job in 1983 was at Napa’s respected Stag’s Leap Wine Cellars, where he became director of cellar operations before leaving on a winemaking odyssey through several countries and states. CedarCreek recruited him from a Washington winery. CedarCreek’s aging winery was rebuilt; by 2002 Tom had state-of-the-art winemaking tools, including some of the most expensive French barrels to be found in any Okanagan winery. CedarCreek was Canadian winery of the year at least twice in the Canadian Wine Awards during Tom’s tenure as winemaker. He left CedarCreek in 2010. He has since consulted widely on the Okanagan and he launched his own label, DiBello Wines, which produces less than 1,000 cases a year. It is unlikely that he will continue consulting but it is probable that Burrowing Owl will let him continue making his own label. It might be hard to find an Okanagan winemaker more passionate for rosé than Daniel Bontorin, a consulting winemaker whose clients include Volcanic Hills Estate Winery. His own label, Seven Directions, produces only rosé – but rosé with a difference. This spring, he released 97 cases of a vineyard designated Pinot Noir rosé that was partially fermented in new French oak. The wine, sold through Volcanic Hills, various wine stores and through the Seven Directions website, has won several medals since it was released in the spring. Daniel’s rosé-making pedigree goes back to the 2005 vintage when he made Vaïla, the outstanding rosé at Le Vieux Pin. That wine, along with rosé from JoieFarm Winery, probably started the renewed interest in a wine style made now by the majority of wineries. Vaïla is a Pinot Noir rosé. Daniel made three vintages at Le Vieux Pin before moving on to consulting. Subsequent winemakers at LVP have continued to make it in the same vibrant and juicy style of the original. Daniel made the first Gamay Noir rosé for Volcanic Hills in the 2010 vintage. The wine promptly won a Lieutenant Governor’s Award of Excellence. Daniel continues to produce the Gamay rosé for his client. The varietal choice is determined by what is available at Volcanic Hills. For his own rosé, Daniel likes Pinot Noir. In particular, he likes the organic Pinot Noir grown by Kalala Vineyard at Westbank. “The 2007 Vaïla was from the Kalala Vineyard, so I knew the quality of the fruit,” he says. Daniel wants his rosé to be bold and intense. To achieve deep colour and flavour, Daniel leaves the crushed grapes on the skins for four days, much longer than the typical one-day cold soak for rosé. Because Volcanic Hills wants different flavours in its rosé wine, Daniel uses no barrels in those wines. It also means there is no conflict between the styles of the winemaker’s wine and the client’s wine. Because Daniel takes advantage of the Volcanic Hills license to make and sell the Seven Directions wines, he might be described a virtual winery. In recent years, a number of such independent labels or virtual wineries have appeared in the Okanagan – so much so that there are reports that the government intends to crack down on virtual wineries. I assume the pressure is coming from the established wineries who don’t like the increased competition. I hope the reports are wrong. Any government that believes in the free market, as this one says it does, should not be in the business of stifling competition and creativity in the wine industry. Shutting down independent winemakers who are trying to raise the bar does not improve the British Columbia wine industry. Here are my notes on Daniel’s wine. Seven Directions Kalala Vineyard 2012 Pinot Noir Rosé ($27.90). The wine presents with an appealing deep salmon pink hue. The aromas are both floral and fruity, with a big punch of strawberry. The flavours are bold – strawberry and plum with a touch of grapefruit – and the texture is full. It has a dry and lingering finish. This is a serious and elegant rosé, versatile with many food choices. 91. This spring, Garron Elmes, the winemaker at Lake Breeze Vineyards, was given the additional title of president by winery owners, Drew and Barbara MacIntyre. It is a deserving accolade for Garron who was a young South African wine school graduate when he was recruited to Lake Breeze 18 years ago. Over those years, the winery has four ownership changes. It says something that none of them changed winemakers. The reputation that Lake Breeze enjoys now has been earned with the consistent quality of the wines. If anything, the wines have become better, a combination of better viticulture, better equipment and accumulated experience by the winemaker. This spring, the winery released three whites under a new designation: winemaker series. One of them, a blend called Windfall, promptly won a gold medal and subsequently sold out at the winery. The series also included the first Viognier from Lake Breeze. This is one of the hottest new white varietals in the Okanagan, with more that 40 wineries now producing one. There is some evidence that Viognier, also an aromatic white, is beginning to wean consumers away from Gewürztraminer. The rising popularity of Viognier “seems to be the latest trend, much like Pinot Gris exploded a few years ago,” says Garron. Lake Breeze released 500 cases and it is not yet sold out. Here are notes of wines worthy of a president. Lake Breeze Vineyards Winemaker Series Riesling 2012 ($20). The wine has aromas and flavours of herbs, lemon and lime, with a finish that is crisp and almost austerely dry. The racy acidity assures that this wine, good as it is now, really should be laid down for a year or two. 89-91. Lake Breeze Vineyards Winemaker Series Windfall 2012 ($19 and sold out). The wine gets its name not from grapes fallen to the ground but simply from the abundance of the 2012 crop. It is a blend of 40% Pinot Blanc, 20% each of Pinot Gris and Viognier, and 10% each of Sauvignon Blanc and Chardonnay). This wine begins with spicy, floral aromas, leading to flavours of apples and citrus, with herbal notes on the finish. The finish is crisp and refreshing. 91. Lake Breeze Vineyards Winemaker Series Viognier 2012 ($22). This wine begins with lovely floral aromas, along with notes of apricot and green apple. It is rich on the palate, with layers of fruit flavours, including peach and apricot. There is a hint of spice on the crisp and refreshing fine. 90. Gordon Ryan believes that the next popular star in red wines from Argentina, where Malbec dominates now, will be wines from a grape called Bonarda. In fact, Gordon is so convinced that he and Katrina O'Reilly-Ryan, his wife, have invested in an Argentine winery called Bodega Chayee Bourras and they are working on that winery’s Bonarda wines in the Canadian market soon. The Ryans, who now live in Mill Bay on Vancouver Island, tell a remarkable story about the development of their love of Bonarda. Both were born in Newfoundland in the mid-1960s. Gordon, who is the youngest of 14 children, has had a long career in the oil industry and now runs his own consulting firm from Mill Bay. Katrina is an employment counsellor. Gordon grew up a beer drinker. The first of his wine epiphanies came when he was best man at a wedding for a friend of Italian heritage. The Valpolicella flowed freely and the flavours were a revelation to his palate. On returning to Canada, they made a Vancouver Island stopover, intending to stay two weeks. That lasted three years, with Gordon working a year at Cherry Point winery near Duncan to get some vineyard experience. They thought about going to New Zealand and getting involved in a vineyard there. The reality, however, was that this was going to need money. They headed back to Newfoundland and lucrative work in the oil industry. They returned to Vancouver Island in 2005 with the thought of finding a vineyard. At the same time, Gordon partnered with colleagues to establish his own oil and gas consulting business and that generated the cash flow to keep him hunting for his own vineyard. Initially, they looked on Vancouver Island. They tried to buy Blue Grouse Estate Winery but could not agree on terms. The hunt turned to Argentina in 2007. “My favourite wine is a good full-bodied red,” Gordon says. Plenty of those were coming from Argentina, so he began looking there. His timing was right. Argentina has just coming through one of its periodic financial crises in which the peso has been devalued. Vineyards and wineries were a comparative bargain. After several years of looking, Gordon found a vineyard in the Cuadro Benegas district near the city of San Rafael, about two hours south of Mendoza, Argentina’s wine capital. The vineyard owner, Carlos Gomez Bourras, had run short of funds while building Bodega Chayee Bourras. “Our idea was to buy a vineyard and, if we want to produce wine later, we would build a winery,” Gordon says. “It just so happened we came upon a guy who was looking for a partner. He had to sell his land to finish his winery.” The winery was completed after Gordon purchased the 50-acre vineyard (half of it planted) in 2009. With another Canadian, Craig Gamble, Gordon is just taking a 40% interest in the boutique winery which was completed in 2010. “We were able to make the wine in partnership with him,” Gordon says, noting the owner’s son, José, is a winemaker. The winery also employs an experienced consulting winemaker. Depending on the source one goes t0, Bonarda is an old French or Italian varietal. The cuttings likely were brought to Argentina by one of the early waves of Italian immigrants. The variety thrived to become the most widely grown red until this decade, when it was overtaken by Malbec acreage. “That’s what the plan is for three years,” Gordon says of the winery, which still sells most of its grapes. “We will ramp it up when we get it established.” He also plans to make a Malbec. The two Bonarda wines they are offering illustrate the versatility of the variety to make both an easy-going quaffer and a big, cerebral red. Chayee Bourras Bonarda Classico 2011 (estimated price $23 - $25) is aged entirely in stainless steel with oak immersed in the wine. It is a delicious wine, with aromas and flavours of a potpourri of red fruits (blackberry, raspberry, cherry), placing sweet fruit flavours on the palate. However, the wine, with soft tannins, has a dry finish, with persistent fruit flavours. 90. Chayee Bourras Bonarda Reserva 2011 (estimated price $45) benefits from more winemaking tricks, starting with longer hand time and maceration after fermentation (30 days) as well as before. That extracts more flavour and a richer tannin structure. The wine also is aged six months in oak – 70% French barrels, 30% American barrels. The result is a rich and full-bodied with dramatic aromas of black cherry, vanilla, spice and coffee. On the palate, there are flavours of plum, black cherry and coffee. 91. The Ryans are not the only Canadian investors in Argentina. In March, Ann Sperling and Peter Gamble released (in Ontario) a $60 Old Vine Malbec under the Versado label. Ann and Peter are leading consulting winemakers in Canada who also own a vineyard and guest house near Mendoza. The couples know each other. On his first trip to Argentina, Gordon stumbled on the guest house. Subsequently, the Ryans have stayed there. “I have kept in touch with them,” Gordon says, who bought a bottle of Sperling Vineyards sparkling wine this summer as a gift for his Canadian staff. For Rick Thrussell, the dream of the winery lifestyle was planted during an Okanagan camping vacation in the early 1980s when he and his friends spent an afternoon at Uniacke Estate Winery. The predecessor to CedarCreek Estate Winery, Uniacke had opened in 1980 and was one of the Okanagan’s earliest cottage wineries. Rick has a vivid memory of that afternoon. “It was one of those quintessential Okanagan days,” he remembers. “It was warm and I was in my shorts. I looked out over this vineyard and thought what an enjoyable way to live - to get up every day and look at this.” The dream was set aside until 2006, while he pursued other careers. As he considered life after home building, he remembered the afternoon at Uniacke. “I was naïve enough to freeze that moment in my mind and think this is what it is like every day in the Okanagan,” he says. So he decided to become a grape grower. In 2006, he bought a 4.5-hectare (11-acre) orchard on a Summerland bench overlooking Okanagan Lake after climbing a peach tree to take in the stunning view. The fruit trees were removed to make room in 2007 for an organic vineyard with Pinot Gris, Gewürztraminer and Pinot Noir. Now the unromantic side of viticulture caught up, with unusually cold winters setting the vineyard back so that it was only 2012 before enough grapes could be produced for Sage Hills’s debut vintage of 800 cases. “We planted at probably the most difficult time to plant grapes in the last 20 years,” Rick suggests. Heavy rain in 2007 sent a debris torrent sliding through his property and into the lake. Severe frost that winter killed about 15% of the young vines and the subsequent freezes further set back vines already struggling to establish themselves organically. The debut wines were made by consultant Tom DiBello at nearby Okanagan Crushpad Winery, an interim measure until Rick builds his own winery. His ultimate target is to make a maximum of 4,000 cases a year. The goal is to produce premium quality wines which will be priced as such ($28 for the whites, $45 for a Pinot Noir still in barrel. In his view, that is the appropriate category for Okanagan wineries. The Sage Hills vineyard, which is now solidly established, has an exceptional view of Okanagan Lake to the east and of the mountains that border the lake. The planned Sage Hills tasting room will make the most of that view. It will also share the modernist lines of Rick’s cliff top home, a design inspired by his admiration for the work of the legendary architect, Frank Lloyd Wright. The home and the planned winery have geothermal heating and cooling. It is an extension of Rick’s insistence on growing grapes organically without herbicides. Here are notes on the first releases. Sage Hills Small Lots Pinot Gris 2012 ($28). This is a wine of remarkable complexity, starting with aromas of citrus and bready lees. The flavours of apple, pear, peach and lychee unwrap themselves layer upon layer on the palate. The finish is crisply dry. 91. Sage Hills Small Lots Gewürztraminer 2012 ($28). This wine begins with delicate aromas of rose petals, spice and grapefruit. On the palate, there is more spicy grapefruit. However, the flavours are moderated; this is not a flashy Gewürztraminer but a dry, food-friendly Alsace style wine. 88. Sage Hills Syrah Rose 2012 ($28). This delicious dry rosé has spicy aromas and flavours of strawberry and plum, with a texture that almost gives this the heft of a light red table wine. This is a versatile wine, suitable for everything from the hot tub to the grilled salmon. 90-91. Mission Hill Family Estate’s Martin’s Lane brand, which started with a Riesling in 2009, has now grown to three varietals, with a hint of spawning a standalone winery in the future. Martin’s Lane was named in honour of Martin von Mandl, the late father of Mission Hill proprietor Anthony von Mandl. However, the Riesling emerged from a friendship between Mission Hill’s director of wine education, Ingo Grady, and Fritz Hasselbach (left), one of Germany’s leading winemakers. He is one of the owners of Weingut Gunderloch at Nackenheim, a 133-year-old estate that, in the words of the Gault Millot Guide to German Wines, had “absolutely no reputation” before he took over the cellar in 1979. Now, it has a very fine reputation indeed. In 2007 Ingo took Fritz on a tour of all of Mission Hill’s Riesling sites to solicit his suggestions on how Mission Hill could make an ultra premium Riesling. “The idea was to make a special wine, not a wine similar to those made by Mission Hill’s colleagues,” Fritz says. The first vintage of Martin’s Lane Riesling resulting from his counsel was 2009. The winery has now released the fourth vintage, making 986 cases with grapes from two vineyards that, in Fritz’s judgment, produce especially intense flavours. One is the Martin’s Lane Vineyard, a steeply slopped vineyard beside the road leading to the Mission Hill winery. The other is a block of relatively mature (at least 25 years old) Riesling at Mission Hill’s Naramata Ranch. Naramata Ranch is a property formerly known as Paradise Ranch and purchased by Mission Hill in 2001. It is a beautiful vineyard at the north end of Naramata Road not generally open for public visits. Since acquiring it, Mission Hill has replanted almost the entire 80 acres that are plantable, including about 30 acres of Pinot Noir. The new white wine in the Martin’s Lane stable is a Viognier, a variety of rising importance in British Columbia. The first varietal Viogniers were released by Jackson-Triggs and a few small producers around 2001. By the 2006 vineyard census, 52 acres had been planted. Plantings quadrupled to 204 acres by 2011, the most recent census. The impressive new Martin’s Lane Pinot Noir, the second vintage, makes a statement about the Pinot Noir program at Mission Hill. California writer John Winthrop Haeger, who is now at work on a Riesling book, published North American Pinot Noir in 2004. Blue Mountain was the only Okanagan winery to get a full profile. “Most [other wineries] are in the position of Mission Hill, where management is at the point of trying to decide ‘whether to get really serious’ about pinot,” he wrote. That decision has been made. “Our push in the last five years has been on Pinot Noir,” Ingo says. That has included planting about 30 acres at two East Kelowna vineyards and another 30 at Naramata Ranch. One of the winemakers in the team under head winemaker, Niki Callaway, has been given specific responsibility for making Pinot Noir. “And there is talk about building a Pinot winery at the Ranch,” Ingo says. A new Naramata Bench winery, Tightrope Winery came out of the gate strongly this spring with awards in the first competitions in which it entered its first wines. The labels, showing an individual negotiating a tightrope, evoke the sure-footed confidence of owners Lyndsay and Graham O’Rourke. The seed for Tightrope Winery was planted in the decade that Lyndsay and Graham spent working in bars and restaurants at the Whistler ski resort. The jobs supported their skiing along with Graham’s fly fishing and shared meals in fine restaurants. Both were born in 1971. Lyndsay, whose geologist father, Grenville Thomas is a diamond explorer who is in the Canadian Mining Hall of Fame, has a University of Windsor business degree. Graham, the son of an accountant, grew up near Sarnia and learned to fish during summers in a family cottage on the river. His love of the outdoors led to a University of British Columbia degree in wildlife management. They moved to the Okanagan in 2003. Immediately drawn to the vineyard lifestyle, they both took Okanagan College courses in grape growing and winemaking. To further improve their skills, they both went to Lincoln University in New Zealand for honours degrees in those disciplines. The studies paid off quickly. When they returned, Graham joined Mission Hill for six years as a vineyard manager while Lyndsay became the winemaker for Ruby Blues Winery in 2009. Graham’s Mission Hill experience was like a postgraduate course in Okanagan grape growing. Graham was able to work in 26 different vineyards from Kelowna to Osoyoos. Since leaving Mission Hill, he has concentrated on his own vineyard. As well, with a partner, he has launched a viticultural consulting firm. In 2007, soon after coming back from New Zealand, the O’Rourkes bought a four-hectare (10-acre) Naramata Bench property with a million dollar view over the lake. They planted about three hectares (seven acres) of grapes -- Pinot Gris, Riesling, Viognier, Pinot Noir and Merlot, with small blocks of Cabernet Franc and Barbera. They made the first 900 cases of Tightrope wines in 2012, using the Ruby Blues winery. They will build their own winery in a few years. Their plan is to continue selling some of their grapes while keeping production around 1,000 cases a year while the Tightrope brand is established. They intend that the winery’s production will top out at about 5,000 cases. Here are notes the first releases. Tightrope Winery Riesling 2012 ($22). The wine begins with aromas of herbs, lime and pineapple. On the palate, there are flavours of green apple and grapefruit. The bracing but balanced acidity and the mineral backbone give the wine a crisp, refreshing finish. Drink it now if you must but it will be even more complex in a year. 90. Tightrope Winery Pinot Gris 2012 ($19). The wine begins with an appealing fruit salad of aromas – melon, pear, apple – that telegraph the flavours. The texture is full but the finish is dry. This is a very refreshing and well-made Pinot Gris. 90. Tightrope Winery Viognier 2012 ($27). Viognier is a rising star among white wines from the Okanagan and this wine is an example of why that is so. First of all, it captures the variety’s wonderful aromatics. There is a riot of fruit and spice on the nose, including banana, apricot and ripe apple. The palate delivers those flavours, along with hints of orange and coconut. The texture is full. The wine has that gossamer spine of tannin which gives Viognier such excellent focus. The finish is dry and the flavours persist. 91. Tightrope Winery Rosé 2012 ($19). The winery’s notes quip that Lyndsay and Graham walked the tightrope on this Pinot Noir rosé. They had not planned to make a rosé but an early frost nipped some of the vines in a low-lying corner of the vineyard. The fruit had not ripened enough for a table wine but it was more than adequate for a rosé. This wine, which has 10% Riesling in it, was judged the best rosé at this spring’s Northwest Wine Summit competition. The wine presents with an appealing cranberry hue, with aromas of strawberry and citrus and with flavours of cherries and even a hint of red liquorice. It has a satisfyingly full texture with a dry finish. This is an excellent all-round rosé whether you have a refreshing glass on its own or serve it with food. 90.